Remember When Obama And His Supporters Hated And Mocked John McCain? While the left has spent the last few days shedding tears over the passing of Arizona Senator John McCain, it's important to remember that their admiration for him hasn't always been so prevalent. In fact, Barack Obama and his supporters in 2008, when McCain dared to challenge the first African-American candidate for the presidency, offered far less adoration than you'll see today. For his part, the former President issued a statement raving about his longtime adversary, even lauding his tragic war experiences as a test that showed McCain's courage. "Few of us have been tested the way John once was or required to show the kind of courage that he did," Obama said in a statement. "But all of us can aspire to the courage to put the greater good above our own." It is a far cry from those years in which supporters of Obama belittled McCain's war record, mocked him for the injuries he suffered, scoffed at his age, and even compared him to a Nazi. If you're watching media coverage of the Republican 'maverick' today, you'd be skeptical. But yes, all of those things happened just a decade ago. 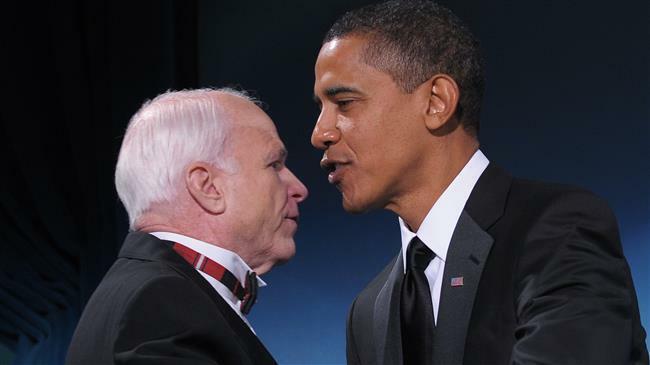 General Wesley Clark, an ardent defender of Obama who was once considered for the role of Vice President, scoffed at McCain's war record, or the 'test' that Barack referenced. "I don’t think getting in a fighter plane and getting shot down is a qualification to become president," he said during a 'Face the Nation' interview. Former Obama adviser Rand Beers attacked McCain saying his "isolation" during much of the Vietnam War (being a POW and tortured), meant that his national security experience was "sadly limited." Liberal blogger John Aravosis added to the reprehensible attacks saying, "getting shot down, tortured, and then doing propaganda for the enemy is not command experience." Aravosis was referring to a false confession drawn out of McCain after being tortured for multiple days and having his ribs broken in a North Vietnamese prison. In a later blog post, Aravosis claimed Obama's people asked him to do "all the dirty work" for the campaign. What is now a test of courage and a sign of McCain's strength was once a source of mockery for his political opponents. A political ad released by the campaign even mocked the Republican's old age and inability to use email, a result of injuries sustained during his years in captivity. "McCain's severe war injuries prevent him from combing his hair, typing on a keyboard, or tying his shoes," Mary Leonard wrote in the Boston Globe in 2000. Rep. John Lewis painted McCain as comparable to George Wallace, a man fostering "an atmosphere of hate" and "hostility" in 2008. Two days ago he called the 'hostile' McCain a "warrior for peace." Then there was the far-left Hollywood crowd who adored Obama and remarkably compared McCain to Nazis and Adolf Hitler, paving the way for Trump supporters years later to not give a rip about the disparaging comparisons. The animated comedy 'Family Guy' featured a scene in which characters were transported back to Nazi Germany and tried to blend in wearing uniforms, one of which had a McCain/Palin button. Madonna, who this go around declared her fantasy was to blow up the White House because a Republican resides there, used a video montage during one of her concerts in 2008 that showed images of McCain alongside photos of Hitler and brutal Zimbabwean President Robert Mugabe. In 2008, @Madonna kicked off her Sticky & Sweet Tour at Millennium Stadium in Cardiff, Wales. At one point, she compared John McCain to Adolf Hitler and Mugabe. Many of those that offer such glowing praise of him today said nothing in his defense then. Not very many offered an ardent defense of McCain at the time. Certainly not the media, and certainly not soon-to-be President Obama and former President George W. Bush. Yet both men have been invited to deliver a eulogy at the Senator's funeral services at the National Cathedral. By contrast, "Mr. McCain quietly declared before his death that he did not want Mr. Trump to take part in his funeral," the New York Times reported. How quickly they have forgotten that Obama and his supporters said the very same things Trump did during the heat of a political battle. One side has been forgiven. The other has not.